Funny how Obama now sees that Iran is a threat and is persuing nuclear weapons… I wonder what would have happened had he been privy to this level of intel when the decision to take out Saddam was made… I bet he would have sang a different tune, but then again he was just a state senator in IL and did not have access to intel this level of intel when he spoke out against going into Iraq. Reporting from Washington — Little more than a year after U.S. spy agencies concluded that Iran had halted work on a nuclear weapon, the Obama administration has made it clear that it believes there is no question that Tehran is seeking the bomb. In his news conference this week, President Obama went so far as to describe Iran’s “development of a nuclear weapon” before correcting himself to refer to its “pursuit” of weapons capability. As the administration moves toward talks with Iran, Obama appears to be sending a signal that the United States will not be drawn into a debate over Iran’s intent. “When you’re talking about negotiations in Iran, it is dangerous to appear weak or naive,” said Joseph Cirincione, a nuclear weapons expert and president of the Ploughshares Fund, an anti-proliferation organization based in Washington. Cirincione said the unequivocal language also worked to Obama’s political advantage. “It guards against criticism from the right that the administration is underestimating Iran,” he said. Obama’s top intelligence official, Dennis C. Blair, the director of national intelligence, is expected to address mounting concerns over Iran’s nuclear program in testimony before the Senate Intelligence Committee today. Iran’s advances on enrichment have become a growing source of alarm. Since 2004, the country has gone from operating a few dozen centrifuges — cylindrical machines used to enrich uranium — to nearly 6,000, weapons experts agree. A report issued last month by the Institute for Science and International Security concluded that “Iran is moving steadily toward a breakout capability and is expected to reach that milestone during the first half of 2009.” That means it would have enough low-enriched uranium to be able to quickly convert it to weapons-grade material. Tehran’s progress has come despite CIA efforts to sabotage shipments of centrifuge components on their way into Iran and entice the country’s nuclear scientists to leave. Iran still faces considerable hurdles. The country touted its launch of a 60-pound satellite into orbit this month. Experts said Iran’s rockets would need to be able to carry more than 2,000 pounds to deliver a first-generation nuclear bomb. Hassan Qashqavi, spokesman for Iran’s Foreign Ministry, on Wednesday warned the U.S. not to wait for Iranian presidential elections this year, because ultimate authority rests with supreme leader Ayatollah Ali Khamenei. “Since a new administration came to power in the U.S., we do not want to burn the opportunity of President Obama and give him time to change the reality on the ground,” Qashqavi said. “They’ve made more progress in the last five years than in the previous 10,” Cirincione said. via U.S. now sees Iran as pursuing nuclear bomb – Los Angeles Times. A new book published in the United States alleges that Venezuelan President Hugo Chavez is an active and open supporter of Hamas and Hezbollah, providing the Lebanese Shi’ite militia with training for its fighters. In “The Threat Closer to Home: Hugo Chavez and the War Against America,” authors Douglas Schoen and Michael Rowan write that through his support of terror organizations and by providing safe refuge for terrorists, Chavez constitutes a real, concrete threat to the United States. Last August the Los Angeles Times reported that Western governments fear that Hezbollah is establishing a growing number of operational cells in the South American country. via Chavez providing aid to Hamas and Hezbollah, says new book – Haaretz – Israel News . Iranian parliament Speaker Ali Larijani said Wednesday that Iran would prefer Democrat Barack Obama in the White House next year. Larijani also dismissed any idea that the US would attack Iran. “We are leaning more in favor of Barack Obama because he is more flexible and rational, even though we know American policy will not change that much,” Larijani said at a press conference during a visit to Bahrain. How to deal with Iran and the crisis over its nuclear drive has been one of the foreign policy issues in the Nov. 4 race for the White House between Obama and Republican John McCain. Larijani, a leading figure in the conservative camp in Iran, also said the United States was too busy dealing with the global financial crisis to consider waging an attack on Iran. Washington severed ties with Iran in 1980 in the wake of the Islamic revolution. US President George W. Bush famously denounced the country as part of an “axis of evil”. Tensions have mounted over Iran’s nuclear program, which many Western countries believe is a cover for ambitions to build atomic weapons, although this is vehemently denied by Tehran. One of the founding members of Barack Obama’s finance campaign team has ties to terrorists. Jodie Evans, co-founder of Code Pink, has personally donated $40,000 to Barack’s campaign and raised between $50,000-$100,000 in donations. Evans has a long history of ties to foreign terrorist organizations and state sponsors, including the “Iraqi Resistance” which is responsible for killing thousands of US Soldiers. This woman undermines our military, undermines our country and puts American lives in danger. Author’s note: It is commonly known that political visitors to totalitarian nations are only let in those nations if the visit serves the purposes of that government, the visitors are accompanied by minders and are monitored at all times and that the government facilitates propaganda events during the visits. The following article is heavily documented with supporting links. The story it tells is very troubling for our nation. It is a story our news media refuses to investigate and report. Please forward this article widely. A founding member of the campaign finance team of Democratic presidential nominee Illinois Sen. Barack Obama has been working with state sponsors of terrorism to undermine the United States in the global war on terror since at least February, 2003. Jodie Evans, co-founder of the leftist anti-American group Code Pink, has documented ties to governments on the State Department’s list of current and former state sponsors of terrorism including Iran, Cuba, Syria and the former Iraqi government under Saddam Hussein. She also has endorsed and worked with the so-called Iraqi resistance that has killed over three thousand American soldiers and thousands of free Iraqis. Evans is listed on the official Obama website as a bundler of between $50,000 and $100,000 in contributions. According to FEC reports, the official Obama website and news accounts, Evans has personally contributed over $40,000 to the Obama campaign—$4600 to Obama for America and around $36,000 to the Obama Victory Fund. Evans served as a co-host for Obama’s first Hollywood fundraiser right after he announced his long-shot bid for the presidency in February 2007, just weeks after she returned from Cuba where she and Code Pink worked with the Castro government to protest the terrorist detention center in Guantanamo. Evans and Code Pink, who market themselves as feminists and human rights activists, blew off the Ladies in White, a Cuban human rights group that asked the delegation Evans led to inspect Cuban prisons where democracy advocates were being held by the Castro government. The propaganda effort against the terrorist detention center at Guantanamo garnered worldwide sympathetic media coverage that undermined America’s efforts in the war on terror. Evans and Code Pink’s trip to Cuba in January 2007 made up for their aborted effort to visit the communist nation the year before to celebrate the anniversary of Fidel Castro’s violent revolution. Let’s go back to the Iraq before we invaded, there was a good education and health care system, food for everyone. That system didn’t belong to Saddam it belonged to the Iraqi, it belonged to years of creating what a civilization needed. If your parents didn’t send you to school they could be put in jail. Evans made several trips to Iraq in 2003 after the liberation. She worked with anti-liberation Iraqis to set up Occupation Watch in Baghdad. The purpose was to propagandize alleged war crimes by American soldiers and to recruit American soldiers into quitting the war by becoming conscientious objectors. Evans did a propaganda interview with a communist newspaper in August, 2003, accusing G.I.s of wantonly slaughtering Iraqi women and children. In December 2004, as the Marines were clearing out Fallujah from al Qaeda and Iraqi Sunni terrorists, Evans and Code Pink delivered over $600,000 in cash and humanitarian aid for what Code Pink called “the other side” in Fallujah. In January, 2006, Evans traveled to Venezuela with Code Pink where she met with Hugo Chavez and protested against President Bush. In April, 2006, Evans led a delegation to Iran. Blog entries by her and her fellow travelers are filled with propaganda designed to undermine U.S. policy againt the state sponsor of terrorism. There is widespread opposition to the occupation. Political, social, and civil resistance through peaceful means is subjected to repression by the occupying forces. It is the occupation and its brutality that has provoked a strong armed resistance and certain acts of desperation. By the principles embodied in the UN Charter and in international law, the popular national resistance to the occupation is legitimate and justified. It deserves the support of people everywhere who care for justice and freedom. In the summer of 2006, Evans and Code Pink traveled to Jordan and Syria. She and Code Pink wrote extensively about the Jordan visit, where they met with pro-terrorist Iraqi parliamentarians who urged them to seek recognition of the so-called Iraqi resistance. Four of us—Gael Murphy, Judith LeBlanc, Diane Wilson and myself—split off from the rest of the group in Syria to make our way to Lebanon. As noted at the beginning of this article, Evans traveled to Cuba in January 2007 to undermine America, then just weeks later she co-hosted Barack Obama’s first big Hollywood fundraiser. In November, 2007, when Obama announced his campaign bundlers, Evans was on the list, as well as her husband Max Palevsky. Evans got more involved in supporting Obama’s candidacy in 2008. In February she hosted a support Obama event and published an endorsement of Obama co-signed by several New York feminists. Evans also expressed her “love” for the anti-American leader of Venezuala, Hugo Chavez, calling him a “sweetheart”, and admitted that Code Pink is trying to “undermine the war effort” of the United States in the war on terror. Several weeks after that interview, Obama received Evans at a high-dollar fundraiser. Evans is listed by the FEC has having made a $7250 contribution to the Obama Victory Fund, a joint fundraising vehicle of Obama’s presidential committee, Obama for America, and the Democratic National Committee. The legal limit, $2300 of Evans’ contribution, was given to Obama’s general election coffers as she had already given the maximum allowed by law to his primary campaign, also $2300, at the Hollywood fundraiser she co-hosted in February, 2007. The balance of the $7250 went to the DNC. 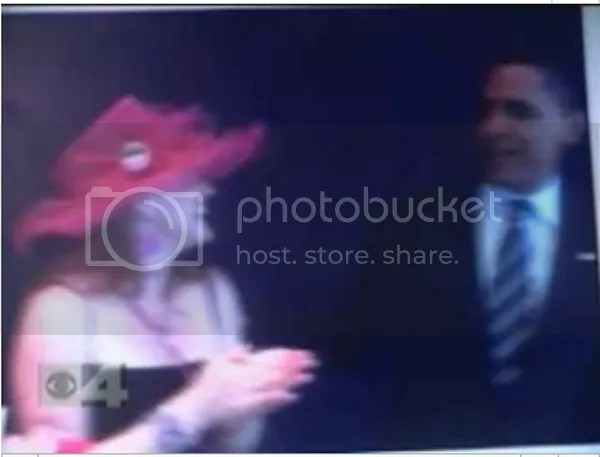 Days after the event, a video was published featuring Code Pink’s Medea Benjamin bragging about Evans’ meeting with Obama. In July, 2008, Evans joined other leftists in signing a letter urging Obama to keep left in his campaign that was published by The Nation. The next month, Evans’ success at infiltrating the Democratic party was recognized with her being given the “Inside the Party” award by the Progressive Democrats of America, a group founded in 2004 at the Boston Democratic national convention to pull the party further to the left. Evans is known by her fellow leftists as a master of the ‘inside-outside game’. After Biden’s speech on Wednesday night, bundlers are invited to an hour-long reception with the vice presidential candidate in a private room in the Pepsi Center, and then on Thursday morning, Barack and Michelle Obama are hosting a breakfast at the Hyatt Regency. After Obama’s acceptance speech, he is scheduled to mingle with bundlers at a private lounge inside Invesco Field. The next week, at the Republicans’ national convention in St. Paul, Evans made headlines by trying to storm the stage during the acceptance speech by Republican vice presidential nominee Alaska Gov. Sarah Palin. Evans spent her time in St. Paul committing identity theft to gain access to the convention and related events. Less than two weeks later, Evans was again received by Obama, this time at an intimate $28,500 per person fundraiser in Hollywood and again later that evening at a $2500 per person fundraiser that featured a performance by Barbra Streisand. Evans capped off her month by meeting with Iranian President Mahmoud Ahmadinejad in New York City. Ahmadinejad’s government has been funding, training and equipping terrorists in Iraq who have killed American soldiers and free Iraqis, as well as Hezbollah in its war against Israel, among many other activities that threaten the free world including seeking nuclear weapons. Ahmadinejad is also no fool. He would know that Jodie Evans, who visited his country in 2005, is in tight with the Democratic party’s presidential nominee and that Obama has stated his willingness to meet with Ahmadinejad and has downplayed the danger of Iran to the free world. This raises the question of whether Evans was acting as an intermediary between Obama’s campaign and Ahmadinejad. The American news media has utterly failed the nation by its willful failure to investigate and report the alliance between Barack Obama and the terrorist supporter Jodie Evans. Evans has brushed off the few queries about this by saying her husband, Max Palevsky, is an old friend of Obama’s from Chicago and she’s just along for the ride. The evidence belies that story. Evans is a player in her own right. In addition to working with state sponsors of terrorism, Evans works with pro-terrorist communist groups in the U.S. Those groups include The World Can’t Wait, ANSWER, Troops Out Now and United for Peace and Justice. Evans is the tip of spear of the pro-terrorist left into the heart of mainstream American politics. There have been several calls from troop support groups for Obama to renounce Evans. He has ignored them and instead has drawn closer politically to Evans as the election draws near. Obama said this summer he knows he needs to earn the trust to be commander-in-chief. He has failed to earn that trust, completely, by allying with Jodie Evans. Jodie Evans and Code Pink lead protest against Marine Corps, Berkeley, CA. Feb. 12, 2008. More photos and story from that protest by Zombie Time here. Cindy Sheehan, Jodie Evans, Hugo Chavez, Medea Benjamin in Venezuela. Photo by Code Pink. Jan. 28, 2006. 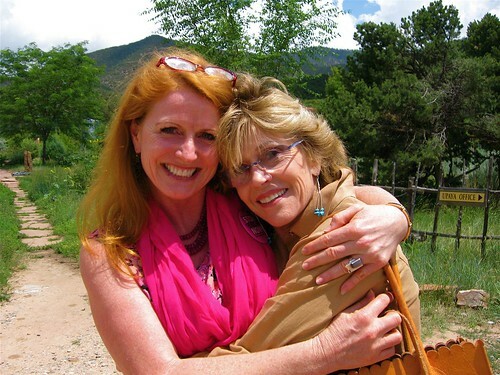 Jodie Evans and Jane Fonda. Now, Jackson is not speaking on behalf of Obama directly, however, it is more than likely he is expressing a shared view of Obama’s. Obama has no plan to support Israel, his first Foreign Policy advisor advocated sending US troops to fight Israel and take the money given to Israel and give it to the Palestinians, Obama feels the US did not have the Moral Imperative to go in and stop the holocaust, would not answer if he would aid Israel if Iran attacked it… Israel is a stong and necessary ally of the US for strategic. Will Obama’s election close the chapter of black grievances linked to memories of slavery? The reverend takes a deep breath and waits a long time before responding. But is Obama – who’s not a descendant of slaves – truly a typical American black? Is Jackson worried about the “Bradley effect” – that people may be telling pollsters they favor the black candidate, but won’t end up voting for him? Jackson declines to be more concrete about possible policy changes. After all, he insists, he isn’t part of Obama’s policy team. Yet he clearly hopes that his views, reflecting the position of many Democrats, would be reflected in the policies of an Obama administration. Would that mean an abrogation of the NAFTA treaty with Canada and Mexico? Would that mean ignoring the four UN Security Council resolutions that demand an end to Iran’s uranium-enrichment program? Jackson says direct talks wouldn’t start without preparations. “Barack wants an aggressive and dynamic diplomacy,” he says. “He also wants adequate preparatory work. We must enter the talks after the ground has been prepared,” he says. Jackson is especially critical of President Bush’s approach to the Israel-Palestine conflict.